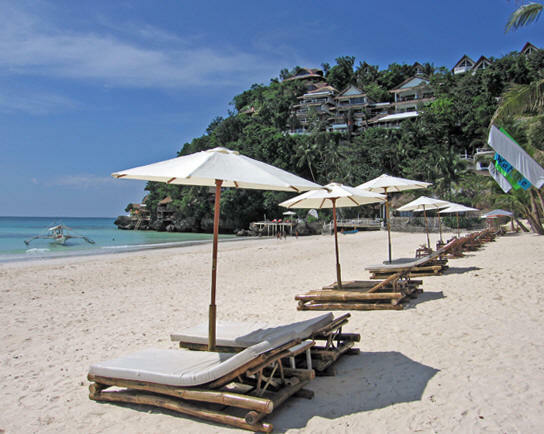 The tropical paradise of Boracay is one of the 7,107 islands that make up the Philippines. 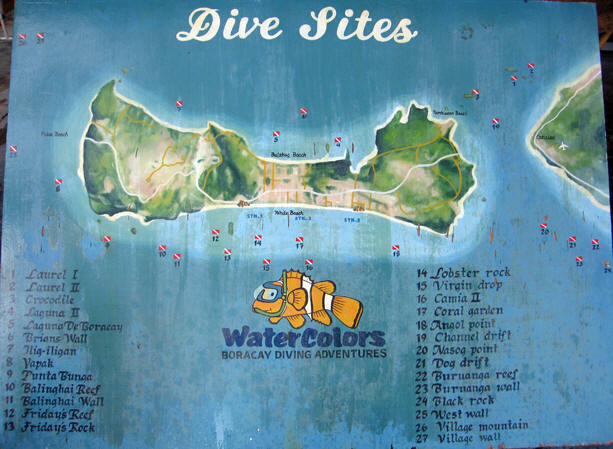 There are hundreds of dive sites located throughout the archipelago, this map shows 27 around Boracay alone! From Cebu City we flew into Kalibo, then a two hour bus trip to Caticlan, seen on the right side of the map, where we took a 30 minute water taxi out to the island of Boracay. 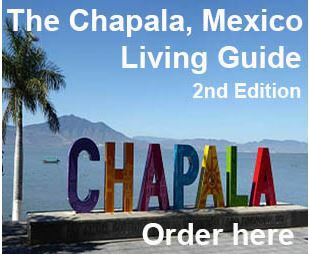 Sailing, snorkeling, diving and general beachcombing are the delights of this charming island. 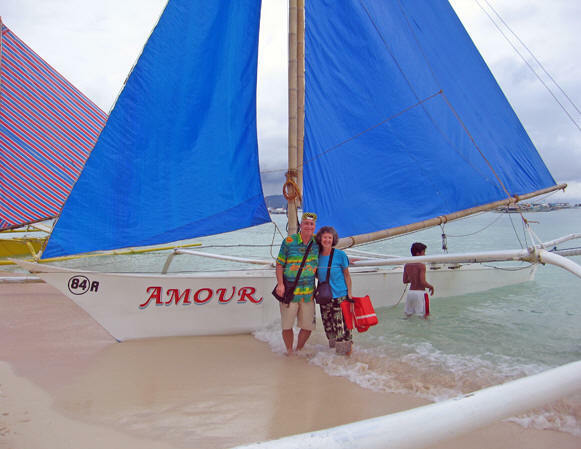 We found the perfect sailing vessel, aptly named Amour, and took several sails and day trips through the aqua waters. Billy loves the sea and is most at home near water. 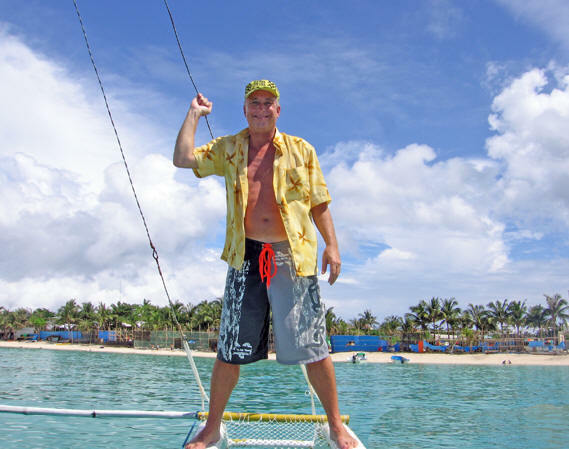 The famous White Beach is behind him, with the bamboo and plastic windscreens that are used during the rainy season to keep the wind and sand from entering the restaurants and shops along the pathway. No motor, only the warm tropical breezes to guide us through the crystal clear water. A very calming and romantic experience. 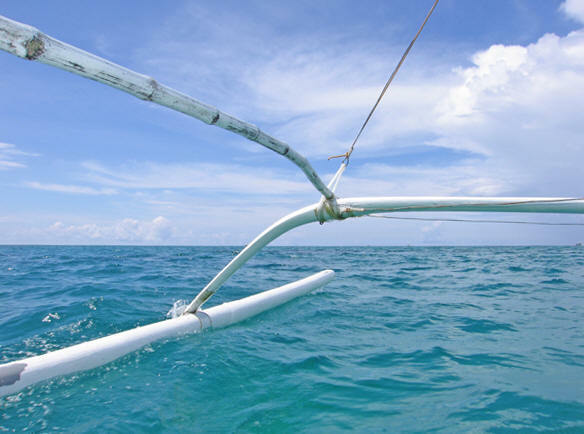 The gentle and rhythmic slapping of the water against the bamboo struts of this catamaran was hypnotic. 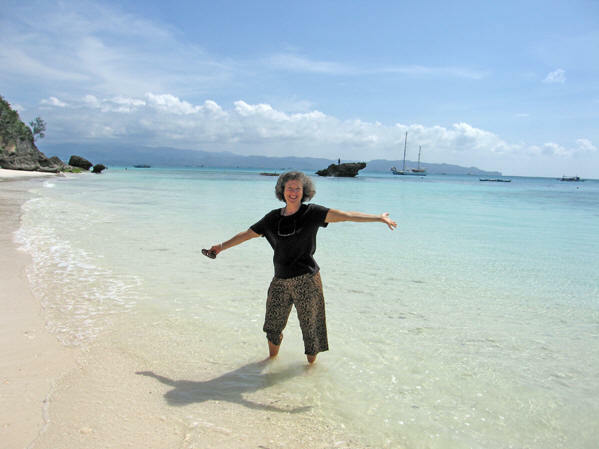 One of our favorite destinations was Diniwid Beach. We made it a point to go there almost daily. It was private, clean and had decent restaurants for lunch. That is the lovely Nami Resort on the hillside in the background. There is an outside elevator to take you from your rooms directly to the beach below! 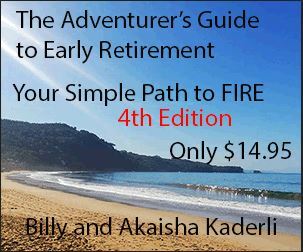 Although Billy is most at home on the water, Akaisha prefers land! This stunning beach and sea view at Diniwid combines the best of both worlds. The island of Panay is in the distant background. Jimsters was a restaurant where we ate many seafood lunches. We'd make the long trek from our beach chairs, those in the picture, up to our table in the shade to feast on the fresh catch of the day. 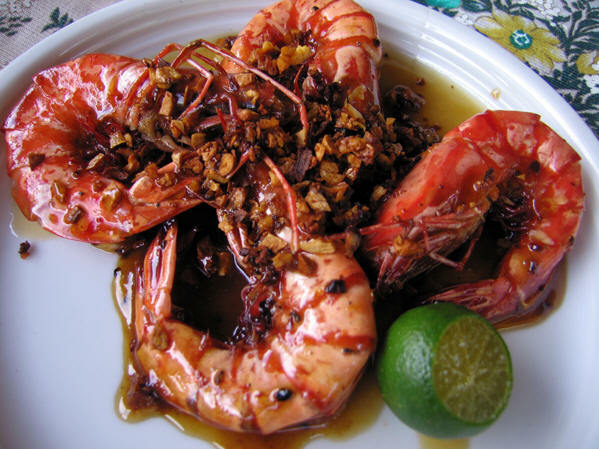 The Seafood Pasta was delectable and unusual with its tangy lime sauce, or the grilled local fish with toasted garlic, or tiny squid done in coconut milk served with coconut rice. 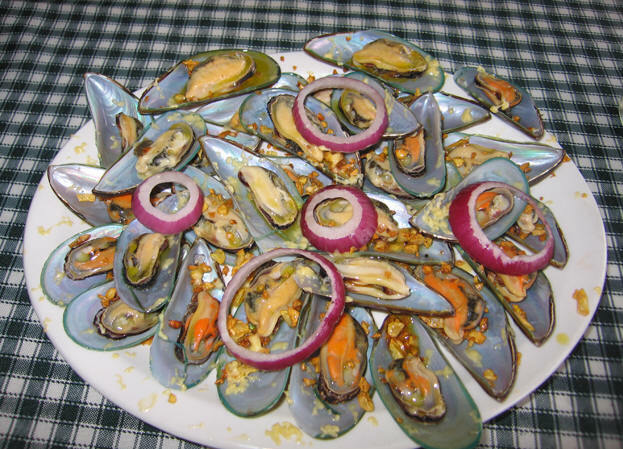 One day when we were especially famished, we ordered the Seafood Pasta and the baked mussels with garlic and cheese. The pasta arrived but not the mussels. "One moment, Sir," the waitress promised. After the pasta was devoured and our chilled drinks long gone, we see the chef running back to the kitchen with a bag of seafood fresh from the market! He had driven his motorcycle 4 kilometers into town to purchase the ingredients for our lunch! The two dozen fresh mussels with crispy garlic and parmesan cheese was worth the wait. Scrumptious! We took a full day sail on Amour to see more of the island from the sea perspective. This is our captain and crew. When we were in the open seas, we would be going 19 km per hour as measured by our GPS. The tiller is controlled by two ropes. 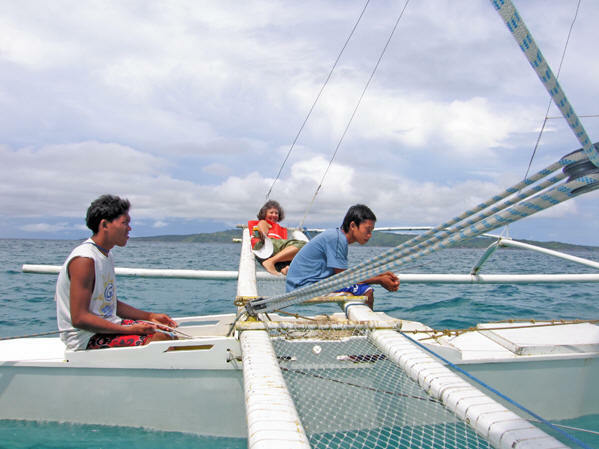 Sailing since the age of ten, Refeel has 16 years of experience and his confidence and professionalism was apparent. Pristine palm lined beaches surround this tiny 7 km long island which is only 1 km wide at its narrowest point. 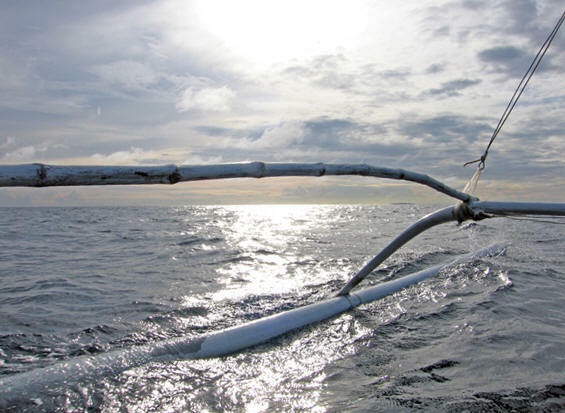 Other than the plywood haul, the mast, boom, and outrigger struts were all made of bamboo. 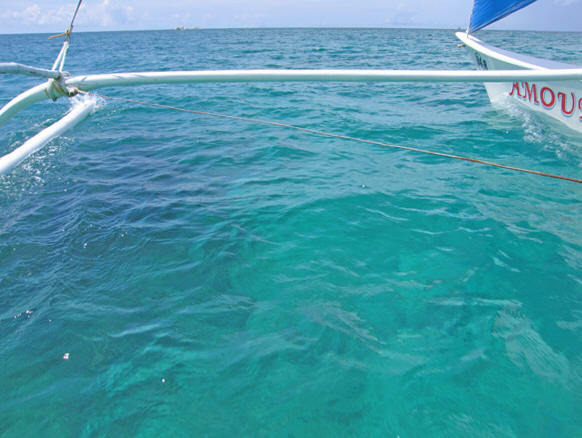 Here, we are on our way to snorkel at the #1 coral reef of Boracay just off a private beach. We stopped here for snorkeling, and a boatman in uniform came to charge us P20 each for the privilege of viewing the fish off the private island. After coming back onboard, this ice cream vendor came by with his inventory. Ice cream is very popular here in the Philippines with vendors carrying or boating their selections right to where the people are relaxing. After all that salt water in our mouths, a sweet treat was just the right choice! 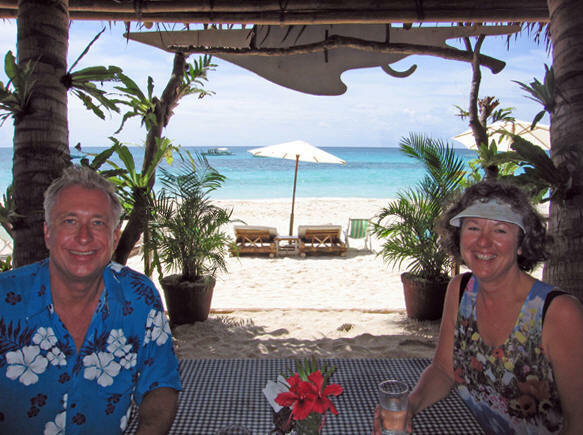 After our snorkeling adventure, we continued on to Puka Beach, famous for the shiny white seashells called puka. Once we landed, we were met immediately by women selling pearls and semi-precious stones as well as restaurant owners trying to get us to eat lunch at their place. The vendors stuck to us like glue! These particular boats are used for fishing. You can see Amour in the upper right hand corner. We chose the restaurant Noime and ordered a plate of stuffed squid and these large shrimp done in a local sauce made of butter, crispy chunky garlic and Sprite! With a little squeeze of lime it was remarkably tasty. The garlic was crunchy like nuts and the Sprite had caramelized with the butter. This beach is on the windward side of the island, having a more weather beaten look. Still, it is postcard perfect! 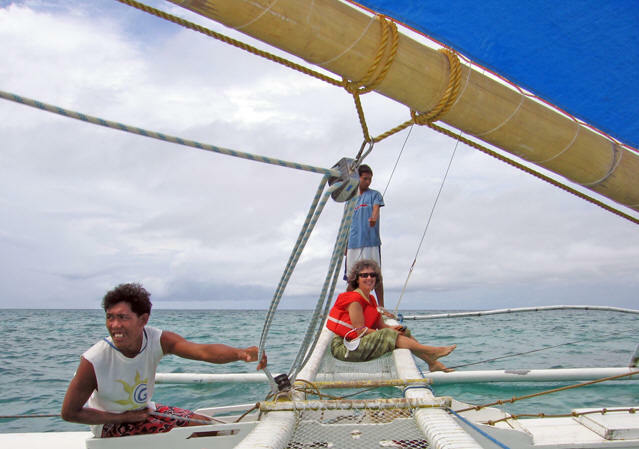 The distance between islands is short so we also visited the neighboring island of Panay. After 6 hours of sailing it was time to go home. 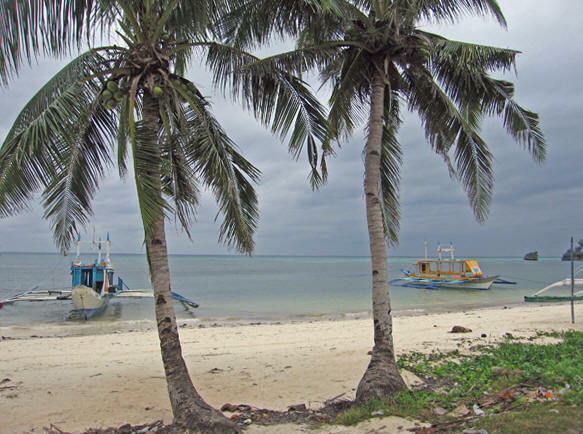 The blues were turning to shades of gray and even though we were passengers, the sun and wind had worn us out. 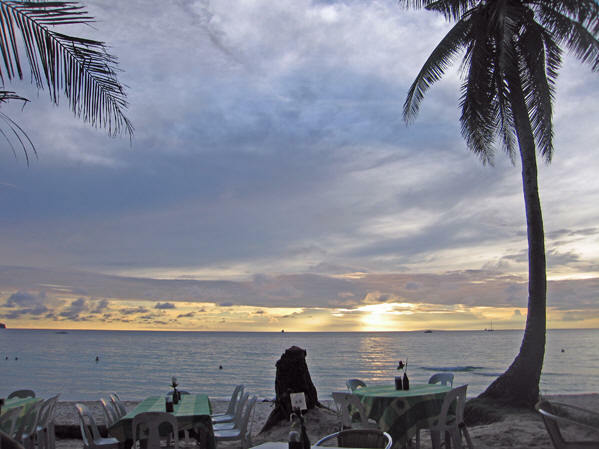 After all this sailing we were ready for dinner, so we chose one of the many restaurants lined up on White Beach to watch the sunset. Spicy Latin music and Jazz played from the restaurant behind us creating a dazzling atmosphere. Our 10 days on Boracay came to an end, and we took a private boat back to Caticlan where we next caught an air conditioned bus to the Kalibo airport. This is called a 'wet landing' for obvious reasons... 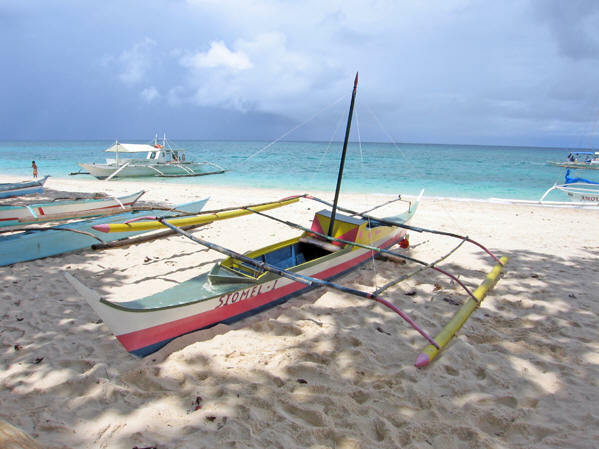 When you go island hopping, you can't worry about your clothes getting some salt water on them. 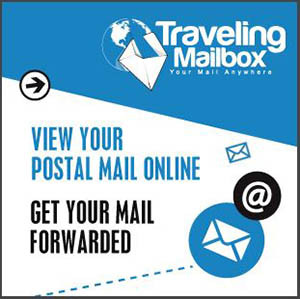 If you have electronic or other precious items, best to wrap them in plastic! 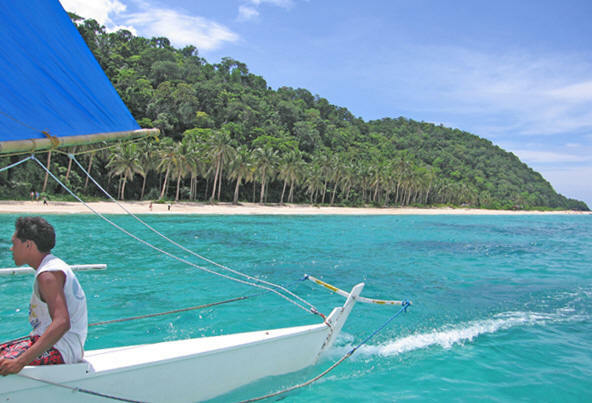 We visited Boracay in the 'Lean Season' where we were able to negotiate the costs of day sailing. 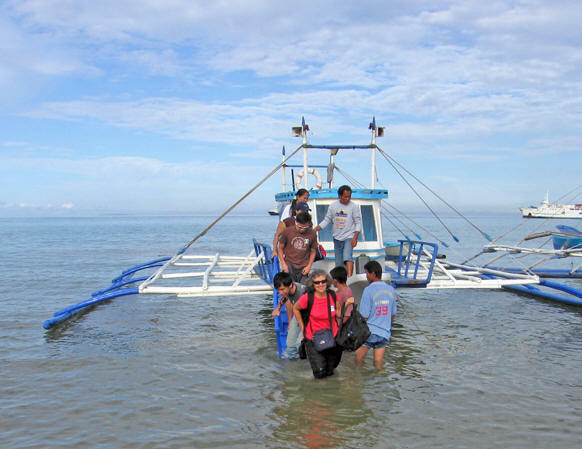 In High Season, the day boating trip would have been P3,000. We paid P1,500. 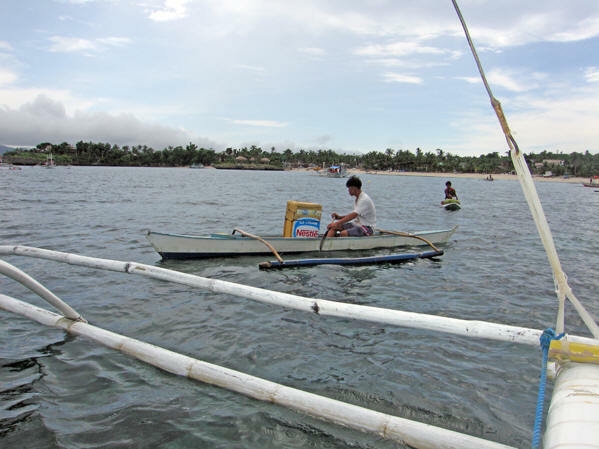 We hired a boat for a few hours for P400. In all, we thought it well worth the price!